Here are some facts about the Acropolis. The Acropolis is an ancient citadel built on a rock in the centre of Athens, Greece. There are other acropoleis in Greece, although the one in Athens is the most well-known. The large flat outcrop is about 150 metres high, and covers an area of about 7 acres. Its most famous building is the Parthenon, which has become a symbol of Greece. The name Acropolis means ‘edge of the city’ in Greek. The area was also once known as Cecropia, after Cecrops, the serpent-man who was the first king of the settlement. The Acropolis became a sacred area when a temple was built there in the 6th century BC. It was dedicated to the Greek goddess Athena, from which Athens takes its name. Over the centuries, the buildings on the Acropolis have had different uses. They have been used as churches, mosques, for storing money and valuables, and to defend the city of Athens from attack. There are two ancient Greek theatres on the Acropolis. The larger Theater of Dionysus could seat 17,000 people and had a stage floor made from marble slabs. The propylaea was the huge gateway leading to the Acropolis. A 10 metre high marble pedestal is in front of the propylaea, on which originally stood a statue of King Pergamon. During the Morean War of 1684 to 1699, many buildings on the Acropolis were damaged by cannon fire. 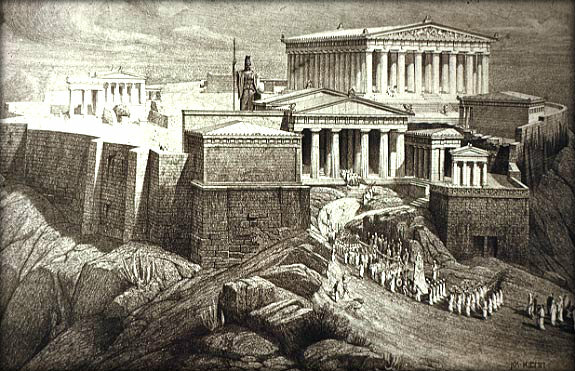 The Parthenon was being used to store gunpowder, and was badly affected. The buildings have also been damaged by pollution and from crude attempts to repair them. The first major excavations on the Acropolis were carried out in the early 19th century. A major restoration project started in 1975, taking over 20 years to complete. Many fallen stone fragments were collected from the Acropolis and used in the building repairs. What next? Discover more facts about the Ancient Greeks by visiting our Ancient Greece resources page.